Near the end of the half-cent’s mediocre life, the redesigned Braided Hair coin saw the lowest mintages of any coin in United States history. It can be argued that the half-cent is an extraordinary oddity in coinage history as well. 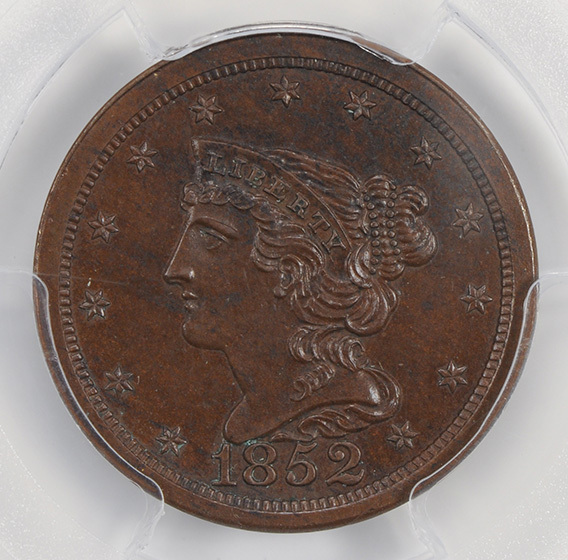 As one of the most unwanted original coins produced it is a wonder the coin remained in circulation from the beginning of U.S. coinage (1792/1793) to 1857. The denomination was originally pushed as a replacement for the frequently used Spanish Milled Dollar and Pieces of Eight in an effort to create a sovereign economic and coin system. Instead, it became a handy denomination to make change from these foreign coins, like the Spanish Real (equal to 12 ½ cent), but this was not useful to consumers who lived away from the seaboard. Despite the early low demand, the coin remained in circulation for another sixty years, but by 1811 the coin was sporadically minted. After several years of frequent mint-vault collection, which met any new business-strike demands, the coin with John Reich’s “Classic Head” was discontinued in 1836. 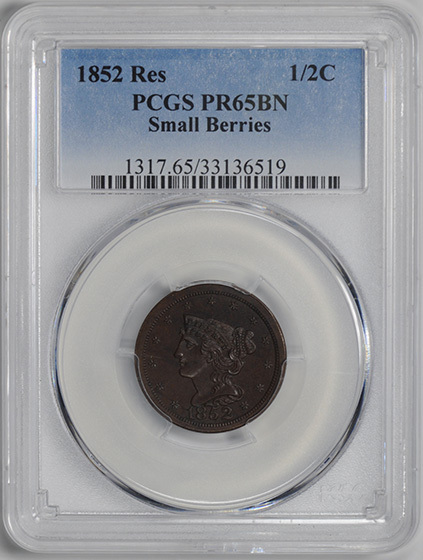 Four years later, on the whim of mint director Robert Patterson, the half-cent was added to the proof sets that were frequently gifted to dignitaries in the mid-nineteenth century. Due to the four year hiatus and the homely-look of the previous design, Patterson had current Chief engraver Christian Gobrecht redesign the coin for proof purposes only. Gobrecht, who is known for his beautiful Seated Liberty designs, utilized Reich’s basic design of the Liberty head but made the design more “American.” The new obverse featured a thinned out, more attractive Miss Liberty ordained in ringlets that surrounded a “liberty” inscribed tiara. The reverse remained the same as Reich’s previous design which had accumulated modifications over the years. The new redesign is often attributed as giving the smallest and most unwanted denomination a sense of dignity. Despite the hurried redesign, the coin was not struck for business reasons for the first ten years of the Braided Hair design. Still the coin remained an imminent part of circulation even though demand was still met through mint-vault stock. It was not until 1851 that the back stock had dwindled enough to authorize new half-cent strikes which featured Gobrecht’s design. Surprisingly, 1851 held the highest mintage numbers for the entire Braided Hair series at 147,672 but was followed by another year of business strike dormancy in 1852. While most of these half-cent coins sported dismal mintage number, many can still be found in uncirculated and circulated grades, but they certainly pose a challenge the avid collector. Proof half-cents, on the other hand, are exceedingly rare with only an estimated fifteen hundred ever struck- though the exact proof mintage in unknown due to secret restrikes. These secret restrikes became a trend after 1850 when coin collection pulled a new interest and sneaky mint employees could not resist the high paying and eager collectors. 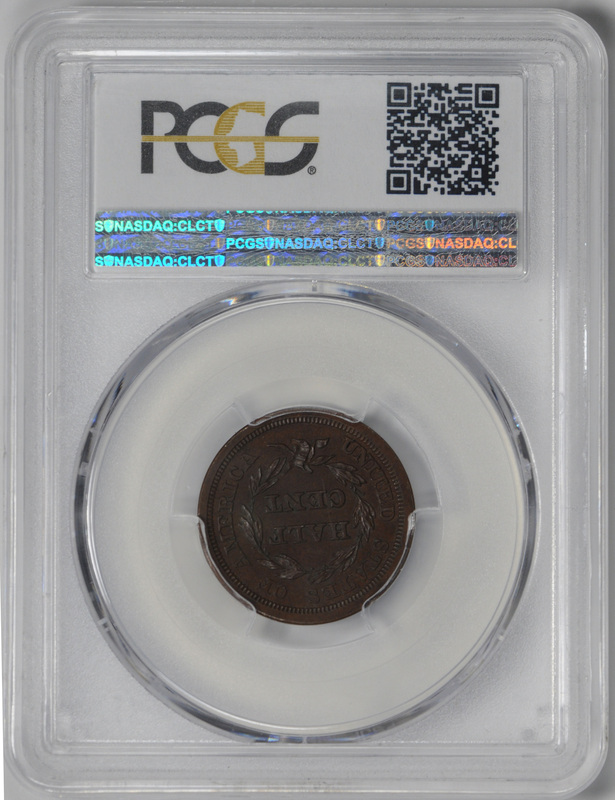 With the new collector demand, mint employees would restrike proofs of certain coin years, especially the retired half-cent after 1857, and surreptitiously sell them for years until director James Snowden discovered the scandal and officially locked away the dies in 1860. Eight years later the newest Director of Mint Henry Linderman pulled the dies out one last time, struck a few more restrikes, and finally destroyed the half-cent dies. Interestingly, these restrikes are easy to differentiate from the originals thanks to the smaller berries found on the restrikes. 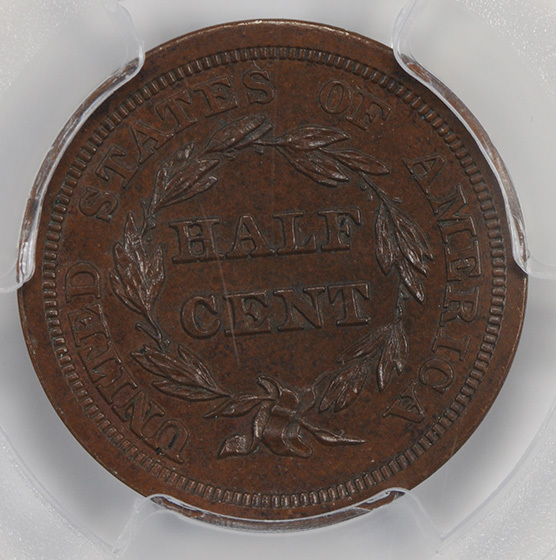 The latter years of the half-cent certainly prove to be an interesting and exciting part of American coinage history which makes this coin a true treasure. While the half-cent struggled to maintain its necessity in the U.S. economy by 1852, the year-old state of California saw an extraordinary economic boom thanks to the gold rush. Since the territory was admitted, populations and businesses continued to flock to California in hopes of riches. Thanks to the gold rush, the United States Treasury Department pushed legislation through congress in 1852 to establish a mint in San Francisco to keep up with gold coinage demand. The mint was not the only business to take advantage of a western demand; on March 18, 1852 Henry Wells and William Fargo joined with several New York investors to establish Wells, Fargo, and Company in order to supply freight and banking needs in the west. The time was absolutely right for Wells and Fargo who provided an unmatched service to the isolated mining towns in California by mailing freight from the east coast. Once the company established itself further out west, they provided a vital service that utilized stagecoaches to transport freight, critical papers, gold dust and eventually passengers trans-continentally. Though the conditions were not ideal for these passengers, who frequently had to endure hold-ups and Indian attack, the service was relatively fast and the only one of its kind early on. Their small freight “pony express” routes, which usually were single riders on horseback, were especially crucial in winter months when the snow packed Sierra Nevada Mountains blocked rail and stage routes from the east. By 1866 the Wells, Fargo, and Company had merged with other major western express and stagecoach lines to build an unmatched Western empire. Unfortunately, the completion of the transcontinental railroad in 1869 ended their supremacy in the cross-country mail arena but the company still provided essential local transportation and banking. Regardless of their newest rival Wells, Fargo, and Company managed to survive even the most turbulent of times and evolved into the banking tycoon known as the infamous Wells Fargo of today.